“Bulk” here does not mean buying an enormous package. In this wonderful section of the store, you get to scoop your own food into your own container, buying exactly the amount you want. First you weigh your empty container and write its weight on the co-op label that you stick on your container. You also write the Price Look Up number, which tells the cash register the price per pound for that food. At checkout, the cashier subtracts the weight of the container from the total weight, and you pay for the food only. I love this system! Instead of paying for a bunch of packaging that we’d throw away or recycle, we use the same containers over and over again. Most of these containers are better than disposable packaging at keeping the food fresh, and they’re at least as easy to open and close. The co-op sells a few types of containers in the bulk section, but we use mostly containers that we saved from packaged foods. Here are some randomly selected examples, neatly photographed by my eight-year-old Nicholas. The salt and lentil jars originally held nut butters. The honey jar is one that I bought at the co-op when a sale on honey caught me by surprise and I wanted to stock up! The garam masala (it’s an Indian spice blend) jar came from baby food. The big plastic jar for the oatmeal dates from the years when we used to buy generic peanut butter in a four-pound jar; those years ended in 2001, when we discovered the co-op and realized that peanut butter made from nothing but peanuts tastes so much better than the generic stuff with such lovely ingredients as “hydrogenated rapeseed oil”. Now the bulk section has a machine for making your own fresh-ground peanut butter! You just hold up your jar and watch the peanuts slide down from the clear holding tank into the grinder and emerge in a triple stream of peanut butter with a pleasantly creamy, fluffy texture–and every so often you shake your jar to settle the peanut butter. This is our usual source of peanut butter, but we’ll occasionally buy pre-jarred natural peanut butter when it’s on sale–but only if it comes in a nice reusable glass jar. Most of our reused nut-butter jars come from almond butter. I’m not sure where we got that tall jar that’s now holding falafel mix, but here’s the scoop on making falafels from this convenient mix! We make the stickers on the jars last as long as possible. (Notice that the garam masala jar has a different logo than the others on its sticker. That’s the old logo; the co-op updated it 4 or 5 years ago, I think.) There’s no point wasting stickers (and the glossy paper off which we peel them) or wasting time filling out new stickers for every purchase. The only thing I don’t like about the stickers is that they can’t go in the dishwasher, so when bulk food jars need washing, I have to hand-wash them. Even hand-washing makes a sticker wrinkle and tear a little bit every time, so after 3 or 4 washings it needs to be replaced. The bulk section of our co-op has two parts. The items shown above are all in the main section. Around the corner, in the next aisle, are the teas and spices. These are some of the best bargains in the bulk section. We once kept a tally of how many cups of green tea we made from a jar of bulk tea leaves: 217 cups for about $7, vs. the typical supermarket price of $3 per 20 teabags! Most spice bottles can be refilled for a much lower cost than buying a new bottle, especially the pretty glass McCormick’s bottles. That chili powder bottle is ancient! Our local mainstream supermarket, Giant Eagle, introduced its own store brand and phased out Food Club products many years ago. We’re running that bottle into the ground on principle, although it isn’t very attractive–I feel kind of nostalgic about it now! 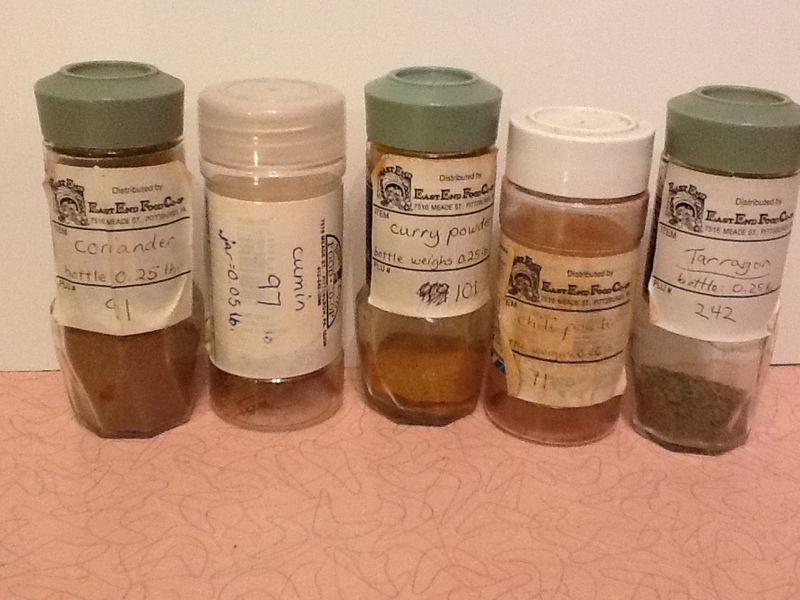 Ew, maybe it is time to replace that chili powder bottle, or at least its sticker! I love that old cornucopia logo, but that sticker is looking gross, and it’s hard to read anymore! Isn’t it a big hassle saving containers and bringing them to the store? It’s definitely a different way of shopping, and it took us a while to get used to it. We just recently set up a better, larger “holding area” for empty containers that we plan to refill at the store; it’s a shelf in an old bookcase in that little room off the kitchen that we hesitate to call a “bathroom” because, although it does have a toilet in one end, the rest of the room is empty and good for storage–but it sounds gross to keep food jars in a bathroom! Honestly, they’re far away from the toilet and shielded by the side of the bookcase. This is much easier than cramming the jars into a large drawer above eye level like we used to do! When we finish the bulk-purchased food, the container needs to be washed only if the food was sticky, like honey or peanut butter. If it’s just a lightly dusty food, we shake out every crumb and then place the jar in our holding area; jars that needed washing go in there after they are fully dry. When I’m ready to go to the co-op, I collect the empty jars that I’m going to refill–which usually doesn’t mean all of the jars in the holding area. It’s important not to stock up excessively on foods that go bad, like falafel mix or dried fruit or nuts, so I take a look at how much is left in the jar we’re currently using and whether or not we have any extra jars in the pantry, before I decide to buy more. I also resist refilling all the jars for foods that often go on sale; I keep a minimum supply until the sale and then stock up. (There are some pricey foods we buy only when they’re on sale, like dried cranberries.) I make sure I’m bringing containers for foods that are on the shopping list. Usually I also bring a few extra, unlabeled containers just in case a sale takes me by surprise. You might have noticed on the stickers that even a little glass spice jar weighs a quarter-pound. The weight adds up, so the bag I’m taking to the co-op is pretty heavy, and on the way home the jars make up a significant portion of the total weight of my groceries. Because we live too far from the co-op to walk there, I always drive. (We live near public transit routes, and the co-op is on public transit routes–but not the same ones! I’d have to travel about twice the distance and spend two or three times as long doing it if I went by bus.) If I were walking, the weight of the jars would be a more serious concern. Then again, if we lived close enough to walk to the co-op, I’d go there more often and do less shopping at one time. In the store, I (often assisted by Nicholas) grab a jar out of the bag, find the bin of that food, and fill the jar. Some foods are in bins that you scoop from, and others are in gravity-feed bins where you hold your jar under the spout and pull the handle. For dry foods in gravity-feed bins, it’s necessary to have a jar that fits around the spout, to prevent the food from flying all over the place! Occasionally I’ve forgotten about this when choosing a jar to label for that food, and then if I don’t have a bigger jar I can swap with, I just have to fill the narrow one as best I can. Then I grab a pen and write, “Get a wider jar!! !” on the side of the label. Cashiers find this amusing. 🙂 When we’ve emptied that jar, I’ll soak off the label and make it a jar for storing leftovers, and meanwhile I designate a wider jar (tape a note on it) for that bulk food. Whenever I start feeling grouchy about wrangling the containers, I remind myself of the couple of times I didn’t have the containers I needed so scooped dry ingredients into plastic bags from the produce section. Some customers do this for all their bulk purchases, but I don’t know how they can stand it! The bag is all floppy among harder items in my grocery bags. It might tear and start leaking. When I get home, I have to pour the contents into a suitable container, and the floppy bag tends to fling lentils (or whatever) all over the kitchen. It’s a lot easier just to take the container to the store and fill it there! Does bulk food cost less than packaged food? Cayenne pepper to fill an old vitamin bottle cost $1.00. That bottle holds at least twice as much as the supermarket bottle that costs $5.99. Ginger to refill one of those fancy glass McCormick’s bottles cost $1.25. A new bottle like that costs $7.89. Thyme to refill the bottle cost 30c. That’s right, THIRTY CENTS. A new bottle costs $6.99! Chili powder to refill the Food Club bottle pictured above cost $1.13. A new glass McCormick’s bottle of chili powder, which is smaller, costs $7.39–but that’s not a fair comparison because we buy the least expensive of the co-op’s three varieties of bulk chili powder, and the supermarket also sells cheaper chili powders. 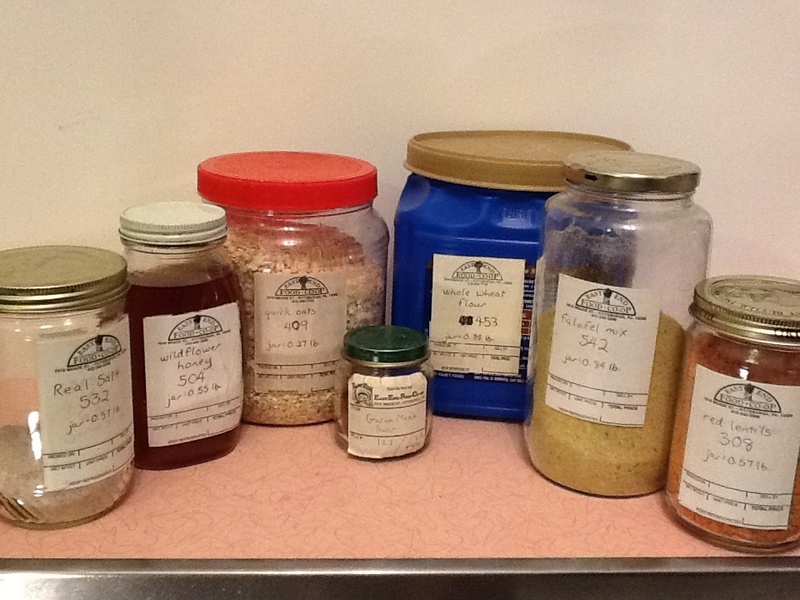 My rule for spices is that if I see the spice for sale in a $1 bottle that’s larger than most spice bottles–like the Spice Classics bottle I made into a scouring-powder shaker–I buy one for the pantry. As long as the price of refilling the bottle is close to $1, I’m willing to refill it at the co-op, too. 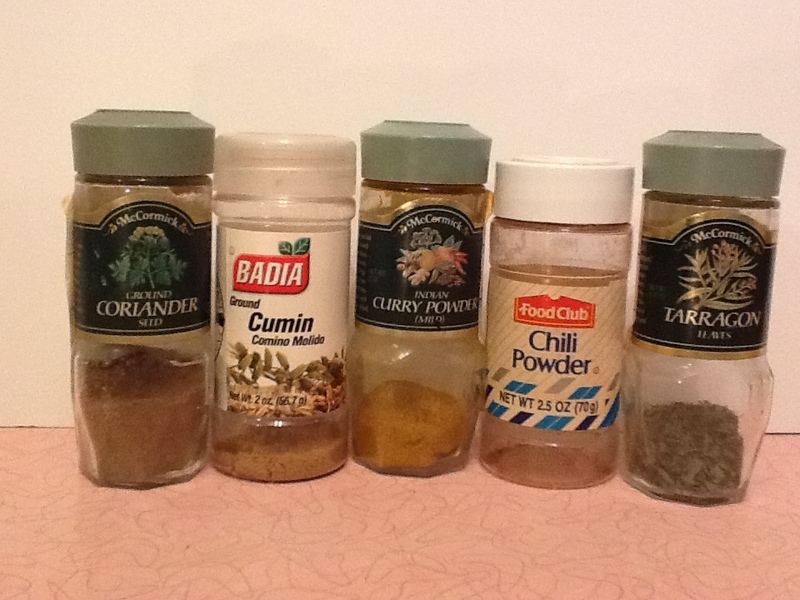 Chili powder, cinnamon, basil, oregano, and dried minced onion are the spices I most often buy for $1. Honey is $6.49 per pound in bulk and is locally made–the best kind for allergy sufferers, as well as better for the environment because it is trucked a shorter distance. The supermarket doesn’t have local honey, so I compared with certified organic honey: $8.40 per pound. Yes, there’s cheaper honey available, but I’ve been reading scary things lately about honey being made in China and laundered through some kind of shady process and adulterated such that it may no longer contain any actual honey…and whatever the truth of that turns out to be, I’m buying local honey! Coffee often goes on sale for $8.99 a pound in the bulk section, while the supermarket’s lowest sale price on comparable coffee (fair-trade organic) works out to $10.64 a pound. I resent the way they try to make it look cheaper by making the bag only 10 or 12 ounces instead of a full pound–using more plastic per ounce of coffee! Although we’ve found a way to get those metallized plastic coffee bags upcycled, we prefer to buy bulk coffee in glass jars. The co-op’s coffee bins dispense whole beans, and they have a grinder if you want to grind it to your preferred texture before you take it home. TIP: When grinding coffee into a jar that is narrower than the grinder’s spout, fold a plastic produce bag around the spout to prevent pulverized coffee-bean hulls from flying into your face. Then shake off the bag and set it aside to use for produce. Raisins are $3.29 a pound in bulk and organic, while the cheapest ones at the supermarket are $3.44 and none of the supermarket’s raisins are organic. Hooray, organic is less expensive for once! Dried cranberries go on sale for $3.39 a pound in bulk, $8.46 a pound in the supermarket. Dried apricots are $7.99 a pound in bulk, $10.64 a pound in the supermarket. Couscous is $2.99 a pound at the co-op and is made from organic whole wheat. The supermarket only carries white-flour, non-organic couscous, in a very small and wasteful package, for $3.20 a pound. We choose to buy the more nutritious, organic, slightly cheaper, unpackaged stuff. One cup, enough for a side dish for the three of us, costs about $1. Green lentils are $1.99 a pound in bulk, $1.09 a pound at the supermarket. I think the supermarket lentils don’t taste as good, though, and the co-op’s lentils are organic while the supermarket’s aren’t, and then there’s that plastic bag around every pound. The co-op’s green lentils are still a very frugal food: One cup, enough for a batch of Honey Baked Lentils that makes six servings, costs about 80 cents. Whole-wheat flour, organic, costs $1.49 a pound at the co-op, $1.20 a pound at the supermarket. I like being able to fill my canister exactly, from the bulk bin. The supermarket’s 5-pound bag always has some extra flour, and then I have to find another container to put it in. Still, I’ll buy flour in either store. Both have great sale prices sometimes. Sunflower seeds for $3.99 a pound in bulk are hulled, toasted, and coated with tamari (wheat-free soy sauce), and they are delicious and organic! The supermarket’s Valu Time sunflower seeds may cost only $2.38 a pound, but they’re not as thoroughly hulled (in my experience) and are coated with regular salt, and they’re not organic, and they just don’t taste as good. I was surprised to learn, in my comparison shopping, that the supermarket’s price for Smucker’s natural peanut butter (lightly salted but nothing else added) has dropped considerably, while the co-op’s price for bulk peanut butter has (like most food prices) gone up in the past few years. The bulk peanut butter is now $5.19 a pound, while the largest jar of Smucker’s is $3.39 a pound. Good to know. That’s a useful size of jar for reuse! But we do like the flavor of that fresh-ground peanut butter from the co-op, so I think we’ll continue to buy some of each. The co-op’s peanut butter is organic; the only organic peanut butter at our nearest supermarket is in a plastic jar, but I’ve seen organic in glass jars at other stores–but usually priced higher than $5.19 for a one-pound jar. Rice. We buy a 5- or 10-pound bag from Costco or Gordon Food Service. Pasta, now that whole-wheat pasta is widely available. We buy it in 5-pound bags at GFS. Granola. We only buy the bulk granola when it goes on super-duper sale about once a year. We like several of the flavors, but most of the co-op’s bulk granolas have more sugar and less protein than our usual granola from Costco. Olive oil. We buy this at Trader Joe’s. Buying bulk food in reused containers works for me! 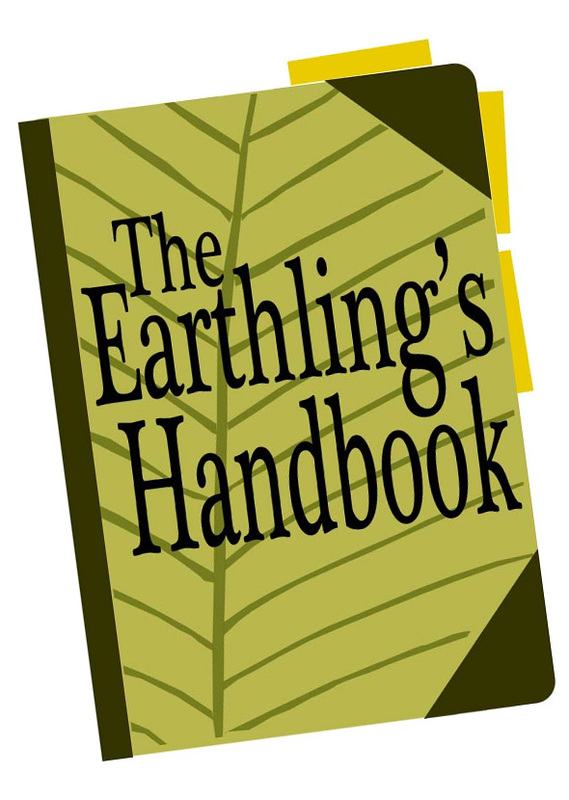 Visit the Hearth & Soul Blog Hop for more articles about food! Visit Green Living Thursday for more ways to reduce waste! UPDATE: Learn all about how to shop the other sections of the food co-op in my article at Kitchen Stewardship! I love shopping at the Co-op, but never realized I could take my own jars for the bulk. I hate taking everything home and transfering it. Now I know, Thanks! Just make sure to weigh each jar and write its weight on the sticker before you fill it! It takes a while to get into that habit. I love the entire idea of bringing your own container and stuffing food inside it. A self-service Co-op with a style all its own. We’re buying more items in bulk, too. I’ve been frustrated, though, because we don’t have the option of bringing our own containers–which means using their plastic tubs/bags. I need to add figuring out whether or not there really is a way to bring our own to my list of things to do this summer. Appreciate this thorough and thoughtful post. We have several stores that offer bulk foods. They offer plastic bags and containers which most people use. But, what I found out is that the store is happy to let me use my own containers. I simply stop at the customer service desk, they weigh and mark my containers, and I’m good to go. Yes it’s one more step but I love that I’m not using plastic or adding to the demand for disposable packaging. Thanks for a great post! By the way, I found you via the Dude, Sustainable! Blog Hop! I did some investigating and found this post about buying in bulk from a co-op in Morgantown, but it’s unclear whether you can use your own containers there. You are so lucky to have a store like this! I would love the opportunity to save this kind of money.